A Day of Peace & Reconciliation - Activate! DECEMBER 16 – A DAY OF PEACE & RECONCILIATION. The very nature of reconciliation is an action of making ones views or beliefs compatible with another. The 16 of December in the South African calendar marks a day in history wherein life-changing historic events took place. One of such events was the battle that took place between the Zulu nation and the Voortrekkers. An army of 470 Afrikaners overthrew and defeated 10000 powerful Zulu warriors with the aid of gunpowder. The day was then commemorated as the Day of the Vow /Dingaan’s Day in 1838. The second fold of the significance of this holiday,dates back to 1961, a year in which the MK (Umkhonto WeSizwe) was formed as a military wing of the African National Congress. The sole purpose of the MK was to extricate the sovereignty and authority of the apartheid government from its roots. The strategy of Umkhonto Wesizwe (MK) was to restore the order of South African affairs prior white minority rule through passive resistance. However, soon after the Sharpville Massacre where many peaceful protestors were gun down, it was no longer seen as an effective means o0f ending apartheid. The third fold of the significance of December 16,was in 1929 where a group of people called the Communist Party of South Africa ( CPSA) organised mass demonstrations aimed at revolting against the Pass Laws in Potchefstroom -Transvaal. In these meetings it was seldom that there was not an invasion or gun spree by the White led government aimed at those gathered, which in most if not all cases, were Black. Years later, after the first democratic elections that took place in 1994, the newly elected government was tasked with the immense responsibility of renaming the day to the Day of Reconciliation essentially between the Afrikaners and Black South Africans. 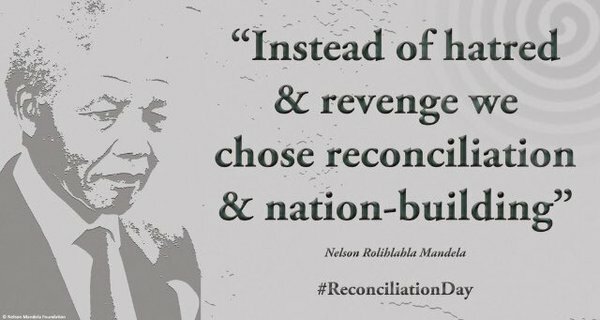 According to sources,the Day of Reconciliation “ was an attempt to strike a balance between a divided past and promoting national unity and reconciliation in a new political dispensation.”-Alana Bailey (2003), Die gelofte van 16 Desember 1838: Die herdenking enbetekenis daarvan 1838- 1910 ( University of Pretoria-Thesis). The Day of Reconcilalition has journeyed an incredible course through history from when it was first known as Dingaans Day( Day of the Vow) to Mandela’s Day of Reconcililation to finally being known as from 1995 as the Day of Reconciliation with the sole intent of unifying the people of South Africa irrespective of race,socio-economic and social standing. Through dialogues, hackathons and Imbizos – ACTIVATE! Change Drivers has set-out to promote peace and reconciliation with the aid of the network of 2000 plus young people plugged in different communities of South Africa. The network has partnered with various organisations who work for a similar cause such as the Yes Peace Network ,MGIEP,UNESCO and traditional leaders to come up with solutions for the problems that most plague the country when it comes to peace and reconciliation. At the core is the insatiable desire to realise a society truly democratic,where racial divide is a thing of the past and not perceived as an advantage or hindrance. Where opportunities are extended to all those who need and are deserving of them without any prejudices connected to race and other stereotypes. Where opportunities are indeed extended to all without the inverse of racial diversity and its negative connotations coming into play. By using different hastags through-out the course of the year which spoke to different campaigns such as #CommittedToChange, #UncensoredVoices , #ValueDemocracy and #BeHumanRights , the ACTIVATE! network continues to actively use social media to drive the much needed social change whose end result is that of celebrating South Africa and South Africans alike without endorsing racial inequality or tolerating hate speech/crimes aimed at uttering insults at another race for one reason or the other. ACTIVATE! Change Drivers celebrates the Day of Reconciliation in honour of the fallen heroes and heroines who fought only to preserve what was theirs, the network also celebrates this day as it marks an activity the world over is in need of,thus Peace and Reconciliation.